Departure Barcelona was delayed about 90 minutes, due to bunkering operations (loading fuel) and the Captain stated that it would not impact our ETA into Lisbon. Well, surprise, surprise, about 3 hours before ETA Lisbon, he made the announcement advising our arrival would be delayed by an hour. Excuses were adverse currents, which are known and adverse winds, which should have also been known from forecasts. Captain Kent, who departed in Venice would probably have provided an update the previous evening advising of a possible delay, with details first thing the next morning, similar to how he handled the delays before Dubai. 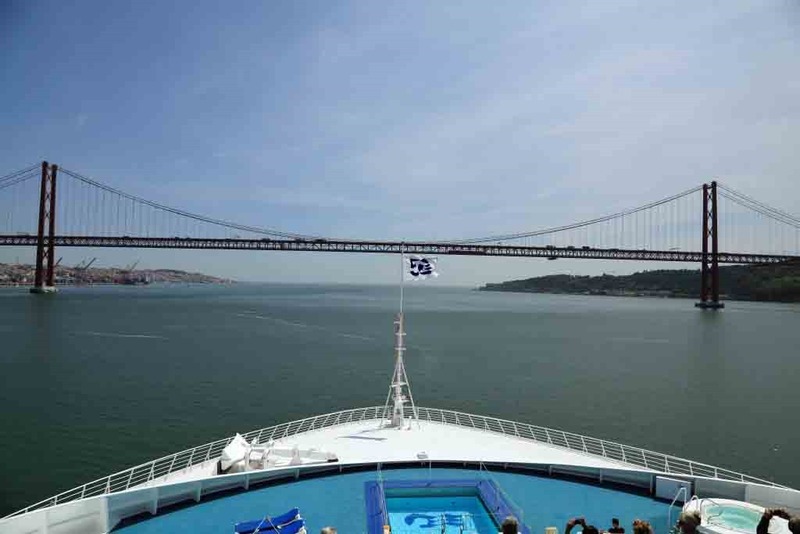 Throughout the morning, Sea Princess maintained N’ly courses in the Atlantic Ocean, following the Portugal Coast towards the entrance of the Tagus River. Sea Princess entered the outer reaches of the buoyed channel shortly before Noon, picking up the pilot about 12:20. Sea Princess passed under the April 25th Bridge about 12:30 and was alongside the berth about 13:00. About 20:30 the Captain let the lines go, thrusting Sea Princess off her berth and turning the ship 180 degrees, before heading out of the port. 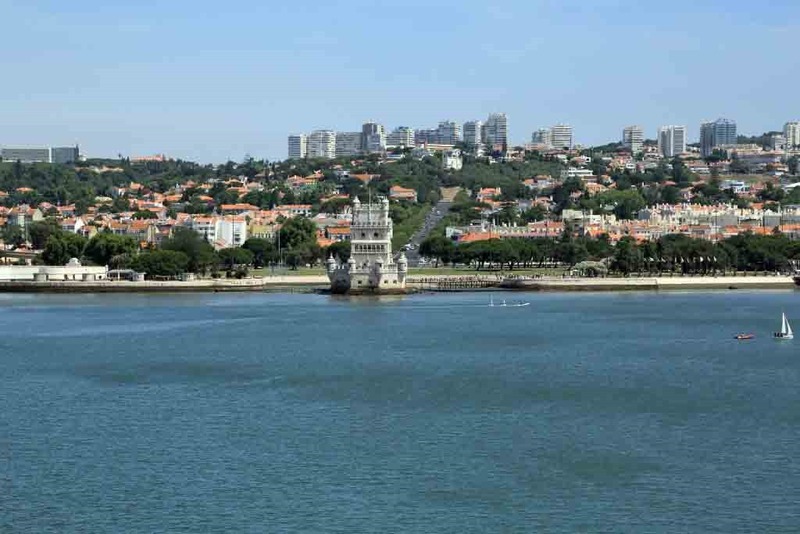 Once the pilot departed and Sea Princess was clear of the Tagus River, N’ly courses were steered at a speed of about 17.5 kts towards our next port of call in Le Havre, France. 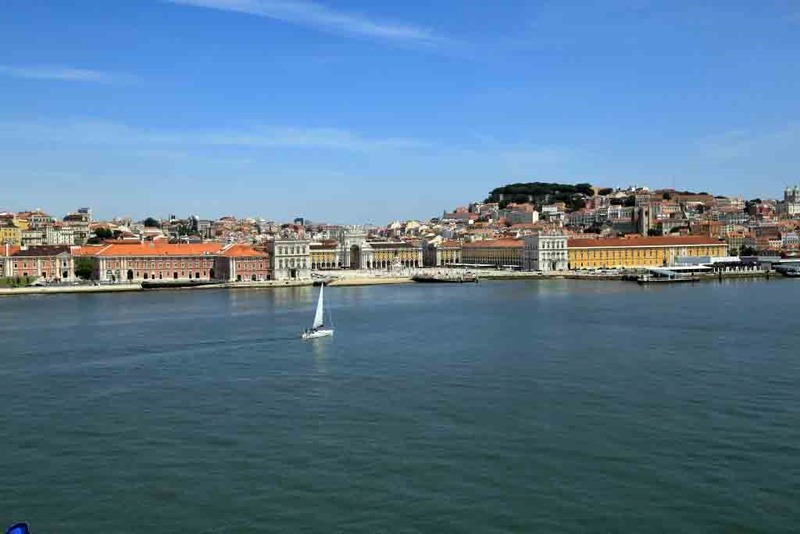 Lisbon is the largest city and capital of Portugal, and being located on the Atlantic Coast gives it the honour of being the Western most capital of continental Europe. 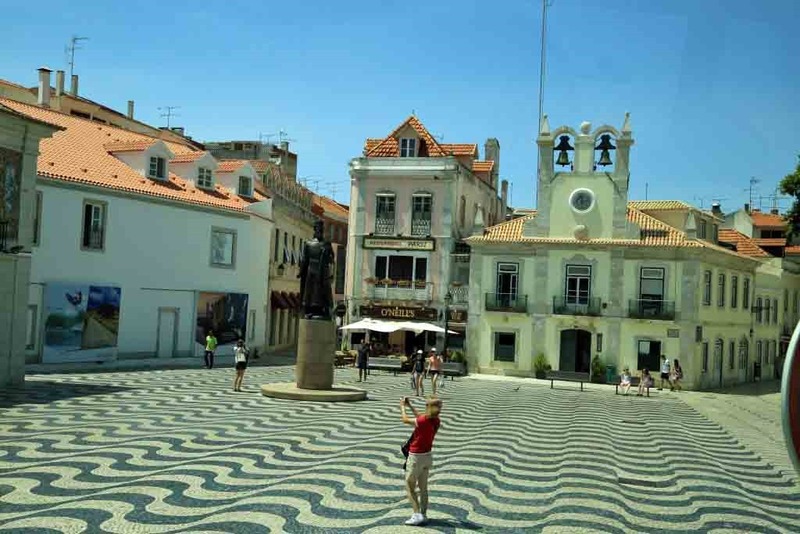 Lisbon is the 11th largest city in Europe and with a population of just over 3 million, which comprises about 27% of the entire population of Portugal. One of the oldest cities in the world, it is now renowned as a global city with a developing financial centre and established international trade, tourism, media and education. Awake bright and early this morning, I headed down for a brisk 6 mile walk around the Promenade Deck, before returning to the cabin and working on photographs, while Judi slept. We headed down to the dining room for breakfast, at which time we received the Captain’s announcement regarding the delayed arrival. The time honoured reasons being adverse current and wind. This was quickly followed by an update from the Tours Office, advising they are going to move heaven and earth to get the tours started quickly and with the exception of 1 tour they were not changing the report times. I worked on Rome photographs after breakfast, until we commenced our approach into Lisbon, at which time I headed outside to watch the arrival and catch a few photos. 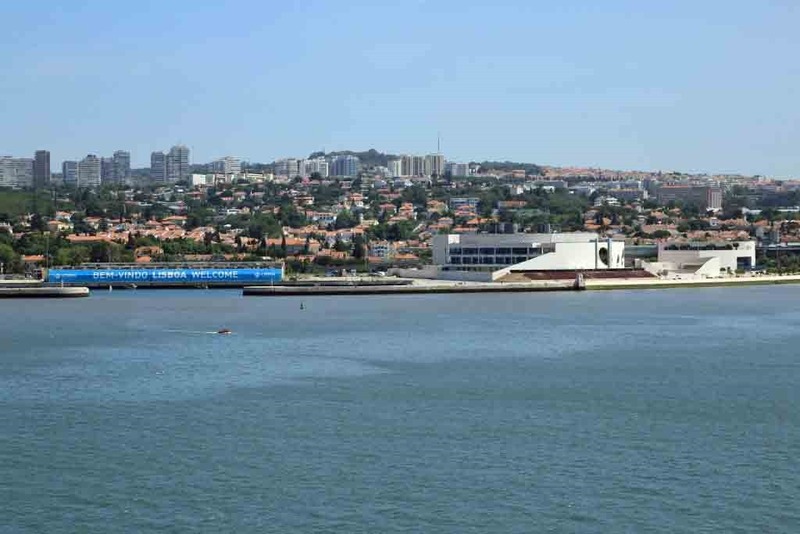 Small marina on the Port shore as we approach Lisbon in strong 30 kt winds. Yet another spectacular failure from the illustrious deck department aboard the Sea Princess. The Seaman has just raised the “House Flag” upside down. In their defense, the Bridge did notice it fairly quickly and had the error corrected. 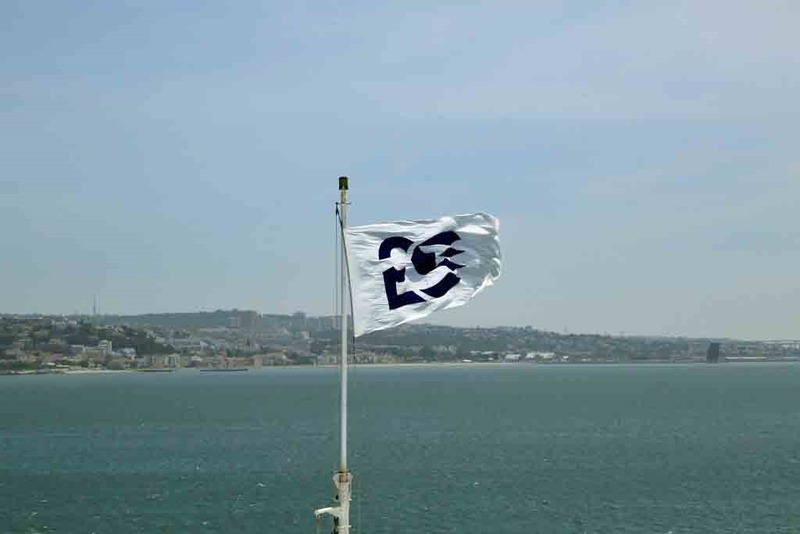 This is the 2nd flag error aboard that I am aware of, as the Courtesy Ensign in Sri Lanka was also raised upside down. 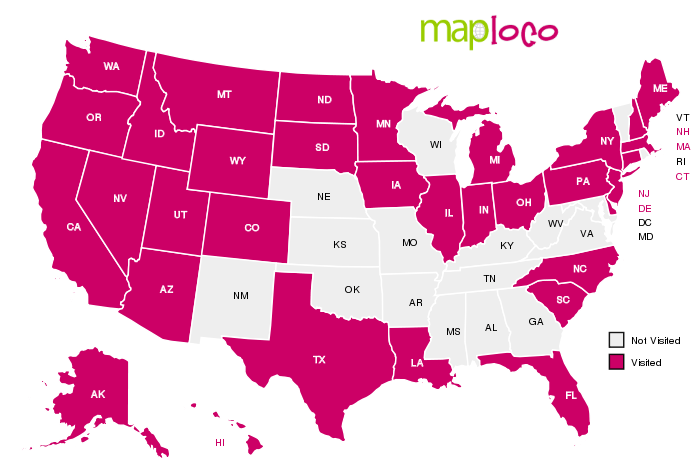 Frankly this should never happen, as flags should have a short tail indicating the top of the flag and a longer tail at the bottom. Welcome to Lisbon sign, with the locals calling the city Lisboa, which is pronounced Lishboa. Belem Tower, which was a military post built on the river to protect the city from attack. Sea Princess approaching the April 25th Bridge, which is very similar to San Francisco’s Golden Gate Bridge. 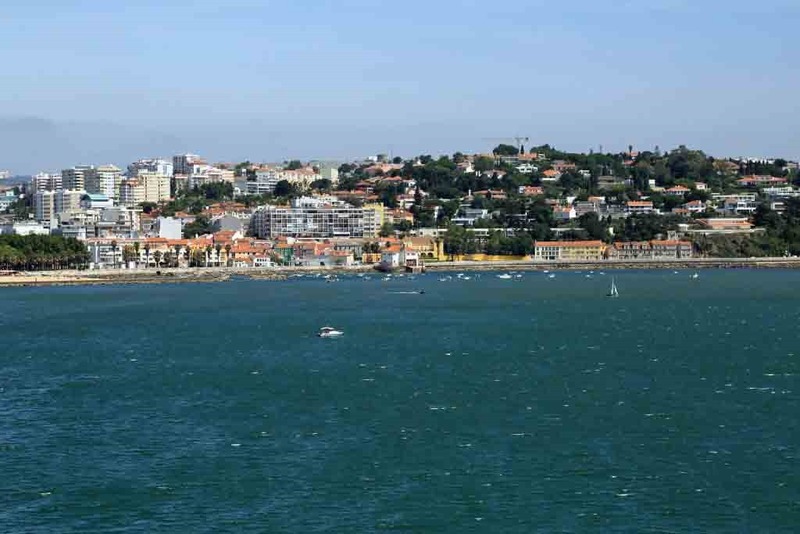 Approaching our berth, after passing under the bridge, the Port shoreline has Fort St Jorge prominently located atop the hill and a large square or plaza right on the shore. As Sea Princess approached the berth, our tour report time was approaching, so I returned to the cabin to get Judi and head to the Vista Lounge. Table mates Bob & Christine were on the same tour, so we waited for them before getting bus stickers and heading into the lounge. After a short 10 to 15 min delay, we were off to the gangway, probably no more than 5 minutes later, than had we arrived on time. Today’s tour was something completely different than the usual large cities, churches and extensive history. It was written as a visit to a quaint fishing village followed by another small mountain village. A quiet drive through the countryside was what we expected. The fishing village may have been a village 100 years ago, but now it is a coastal yuppie tourist trap, where buses are no longer permitted in the town, so we were dropped off at a marina. This is the downtown area of the fishing village, where the tour used to drop you off for free time. This area looked rather pleasant with narrow cobble stone streets in various patterns. That just happens to be an Irish Pub behind the statue, so this would have been an excellent stop. However, we got a half hour at the marina, which consisted of the usual tacky tourist shops. Back on the bus, we were meant to pull over for a photo opportunity at a beautiful beach, but the lay-by was covered in blowing sand and had barriers to prevent access. Again, I suspect it has been a while since buses have been able to stop. 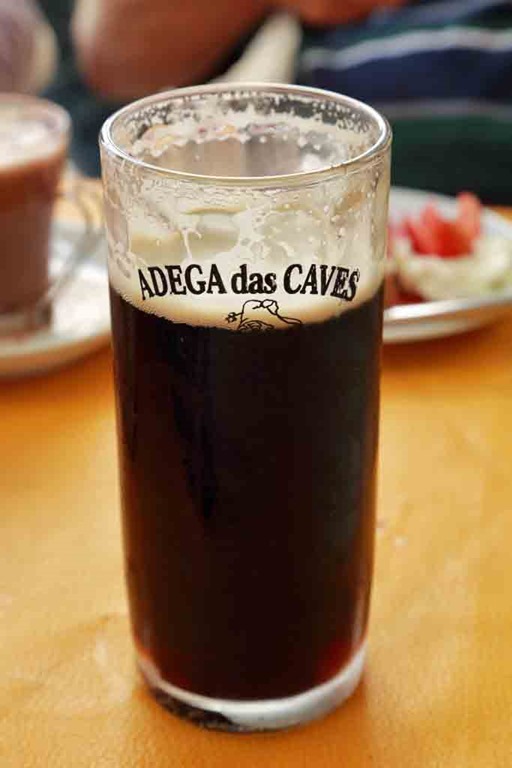 So we continued up the mountains to Sintra, a small town where again buses were restricted in the downtown area. With only an hour, six of us decided to go find a cafe. Liquid lunch at a local cafe. All in all, while the tour description wasn’t overly accurate, we did enjoy getting off the ship and out of the city. Back on board, the restaurants were open seating, so 6 of us from our dinner table agreed to meet in the Horizon Court at 19:30 for a quick dinner. Initially only 1 side was open, but as we were about to head to the serving line, they opened the other side. Wow, we actually got hot food. The lamb stew was particularly hot and tasty. While we don’t normally enjoy the buffet, this was actually one of the better meals on this ship. Even the apple sponge and custard for desert was excellent. On completion of dinner, the ship was still turning off the berth, so we all headed down to our cabins to sit on the balcony watching the departure along the Tagus River. Judi and I sat on the balcony for a couple of hours, until shortly after sunset. A very pleasant and relaxing couple of hours. As another day closes, we bid you farewell, till tomorrow and hope for fair skies and following seas. This entry was posted in Cruise Days, Portugal and tagged 2015 World Cruise, April 25th Bridge, Belem Tower, Flag Etiqutte, Lisbon, sea princess by oriana77. Bookmark the permalink.